[Episcopal News Service] Two congregations in the Los Angeles area, one Episcopal and the other Roman Catholic, have forged an unexpected bond this year, supporting each other after both were attacked by an arsonist in January. 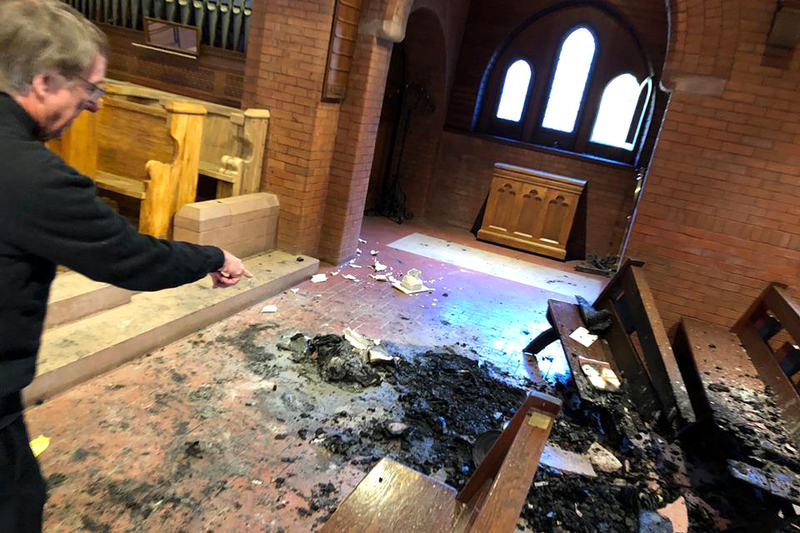 The Episcopal Church of the Angels in Pasadena was hit early Jan. 13, a Saturday, but the fire and smoke damage was not severe enough to cancel worship services. The fire Jan. 25 at Resurrection Catholic Church, however, severely damaged the worship space, and since then, the congregation in Los Angeles’ Boyle Heights neighborhood has been forced to worship outside under tents while the church is being repaired. Two months later, the two congregations have found hope all around them. A suspect has been arrested and charged in these and other church arsons in the region. Worshipers at Resurrection aim to move back into their church by Easter. And Church of the Angels recently raised $2,000 for Resurrection at an Evensong service that was attended by the Catholic congregation’s pastor. The two churches are about 20 minutes apart, but with these newfound connections, they are leaving the door open to future partnerships that would bridge that distance. “We don’t know where this is going to go, but I would imagine new things could come as a result of this,” said the Rev. Robert Gaestel, rector at Church of the Angels, which has an average Sunday attendance of about 100 people. Resurrection Catholic Church is much larger, with as many as 800 people attending one of six Masses on Saturdays and Sundays, the Rev. John Moretta said. He was honored to be invited by Gaestel to attend the March 11 Evensong at Church of the Angels. For both congregations, their churches were spared irreparable damage thanks to the quick work of strangers. At Church of the Angels, the fire was set in the building overnight, and two men spotted it while they were walking home from nearby nightlife hangouts. They shouted for help, which alerted Gaestel, who lives on church grounds. Although the fire was extinguished before it could spread, it still caused nearly $250,000 in damage, mostly due to smoke, Gaestel said. Prayer books, four benches and an antique carved wooden angel lectern also were burned. Graffiti was scrawled on an angel sculpture and paving stones outside the church. But the fire also revealed the connections neighbors feel with Church of the Angels, Gaestel said. Residents who live nearby, even those who aren’t Episcopalians and don’t attend worship services, offered to help with repairs the next day because they saw it as their neighborhood church, he said. With the neighbors’ help, Church of the Angels’ congregation was able to get the church cleaned up enough to worship inside on Jan. 14, though further renovations are continuing. Resurrection Catholic Church was not so lucky. The arsonist tossed a flaming object into the church through an open window late at night. The fire was noticed by two men, who were walking to their car after leaving a job around 2 a.m., but by the time they alerted Moretta, the flames had spread and threatened to engulf the structure. “The firemen told me that if the fire had [burned] two more minutes, we would have lost the whole church,” Moretta said. Instead, the fire caused about $500,000 in damage. Fire insurance is covering most of the cost of repairs at Resurrection, as is the case at Church of the Angels. The congregations also have been raising money for some upgrades to the churches as part of the repairs and remodeling. That is how the two pastors initially made contact. After learning about the fire at Resurrection, Gaestel asked the Very Rev. Michael Bamberger of the area’s Episcopal deanery to attend a news conference in Boyle Heights on Gaestel’s behalf and ask if the Catholic church had information to share on contractors. Bamberger reported back that the damage at Resurrection was much more severe than what Church of the Angels sustained. Gaestel later called Moretta, who invited him to lunch and to visit Resurrection. Church of the Angels had scheduled its Evensong as a sendoff celebration for its longtime choir leader, who was leaving, and after conferring with the choir leader and vestry, Gaestel invited Moretta to attend. He also asked his parishioners for donations to support Resurrection’s rebuilding. The two pastors have remained in contact. Moretta noted that both have decades of service in their respective congregations. “He’s been at his parish 35 years. I’ve only been here 34 years,” he said. Moretta also invited Gaestel and his family to a celebration in late April in honor of Moretta’s 50th year of ordination, and he hopes to have Gaestel back when the Resurrection congregation blesses its restored church, likely in May. As for the suspect in the arsons, his motive remains unclear. Christian Michael Garcia, 25, was arrested shortly after the arson at Resurrection and has been charged with 20 felonies, including 13 counts of vandalism to religious properties, according to the Los Angeles Times. A church fire is traumatic enough for a congregation, but Gaestel said that trauma is worsened when the fire is set intentionally.